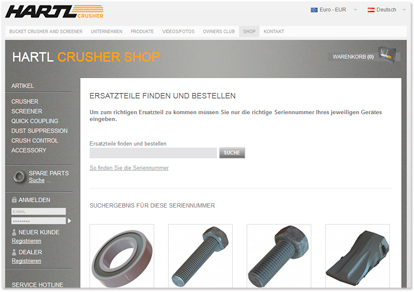 Hartl Crusher Shop | WELCOME TO THE NEW HARTL ONLINE SHOP. WELCOME TO THE NEW HARTL ONLINE SHOP. Hartl Crusher specialized in the development of rock crusher and screener units thereby adding a whole new dimension to users in the processing industry. Benefit from our unique offer to order Hartl products and spare parts at our Online Shop - it's easy, quick and reliable! Order Crusher, Screeners, options and supplementary products: it's easy, quick and reliable! Our innovative Hartl Crushers and Screeners are extremly versatile. Your investment will very soon pay for itself. 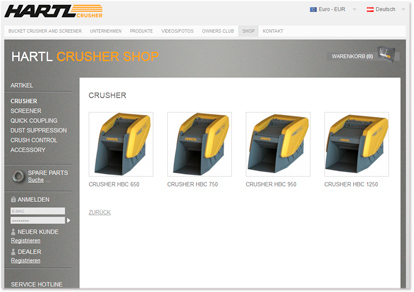 You can now simply order Hartl Crushers and Screeners at our Online Shop! It never was easier to get the right original spare parts. 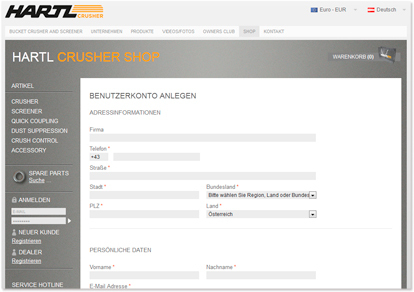 Order the spare parts for your Hartl Crusher and Screener online - it's easy, quick and reliable! Just keep your machine's serial number at hand.